Beyond their status as classic children's stories, Laura Ingalls Wilder's ""Little House"" books play a significant role in American culture that most people cannot begin to appreciate. Millions of children have sampled the books in school; played out the roles of Laura and Mary; or visited Wilder homesites with their parents, who may be fans themselves. Yet, as Anita Clair Fellman shows, there is even more to this magical series with its clear emotional appeal: a covert political message that made many readers comfortable with the resurgence of conservatism in the Reagan years and beyond.In ""Little House, Long Shadow"", a leading Wilder scholar offers a fresh interpretation of the ""Little House"" books that examines how this beloved body of children's literature found its way into many facets of our culture and consciousness - even influencing the responsiveness of Americans to particular political views. Because both Wilder and her daughter, Rose Wilder Lane, opposed the New Deal programs being implemented during the period in which they wrote, their books reflect their use of family history as an argument against the state's protection of individuals from economic uncertainty. Their writing emphasized the isolation of the Ingalls family and the family's resilience in the face of crises and consistently equated self-sufficiency with family acceptance, security, and warmth.Fellman argues that the popularity of these books - abetted by Lane's overtly libertarian views - helped lay the groundwork for a negative response to big government and a positive view of political individualism, contributing to the acceptance of contemporary conservatism while perpetuating a mythic West. Beyond tracing the emergence of this influence in the relationship between Wilder and her daughter, Fellman explores the continuing presence of the books - and their message - in modern cultural institutions from classrooms to tourism, newspaper editorials to Internet message boards. 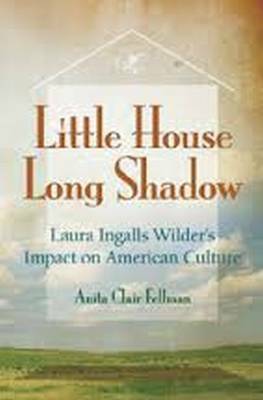 ""Little House, Long Shadow"" shows how ostensibly apolitical artifacts of popular culture can help explain shifts in political assumptions. It is a pioneering look at the dissemination of books in our culture that expands the discussion of recent political transformations - and suggests that sources other than political rhetoric have contributed to Americans' renewed appreciation of individualist ideals. "An important, impeccably researched, and original book. Fellman breaks new ground in probing children's literature as a source of political socialization and of adult ideology." --Elizabeth Jameson, coeditor of "The Women's West"
"There is much to admire in this book. Many have casually noted these connections, but no one has put them all together so well." --William Holtz, author of "The Ghost in the Little House: A Life of Rose Wilder Lane"
An important, impeccably researched, and original book. Fellman breaks new ground in probing children s literature as a source of political socialization and of adult ideology. Elizabeth Jameson, coeditor of "The Women s West""
There is much to admire in this book. Many have casually noted these connections, but no one has put them all together so well. William Holtz, author of "The Ghost in the Little House: A Life of Rose Wilder Lane""